Not just late, but very late. The question is... am I disastrously late? 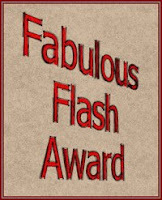 So many months ago, I was honored by Marisa Birns, Maria Protopapadaki-Smith, John McDonnell, Gracie Motley and Icy Sedgwick with blogging and fiction awards. As I was on the road at the time, and almost entirely off-line, I couldn't respond very well over my phone, but I promised to follow-up as soon as I got back to a computer. However, life came at me with teeth bared and claws outstretched. "Soon" became "real soon" became "this weekend" became "oh my God". For months, this has been an unresolved item on my to-do list, a flagged e.mail in my inbox, carried forward and carried forward and carried forward again. These folks deserve better treatment than that! I know they've moved on and I'm probably making too much of this. I do that kind of thing a lot. Still, my obligation remains. So, let me offer my thanks for these awards. I encourage everyone to go check out their fine blogs and online fiction, and to buy them a drink if you ever meet them in a dimly lit pub. No worries, Tony. You're very welcome and well deserving of all your awards. Wait, how'd I get implicated in your heinous scheme to ignore your awards? Ha! Congrats on the awards. I'm embarrassed to say you just reminded me about a similar faux pas. Oops. Hope you like the haikus in your Christmas card, too. Thanks, guys. I try not to let such things slip, so, for better or worse, I'm glad to be able to make up for my tardiness. I'm looking forward to it, Icy. Yours went in the post this morning! You are most welcome, sir - and no worries on the delay! I'm just as bad as you. Gads.